The hotel is located in the fashionable Dubai Marina area and is within walking distance to the beach and the prestigious Jumeirah Beach Residence (JBR) Walk, a 1.7km waterfront strip populated with trendy restaurants, cafes and shops. 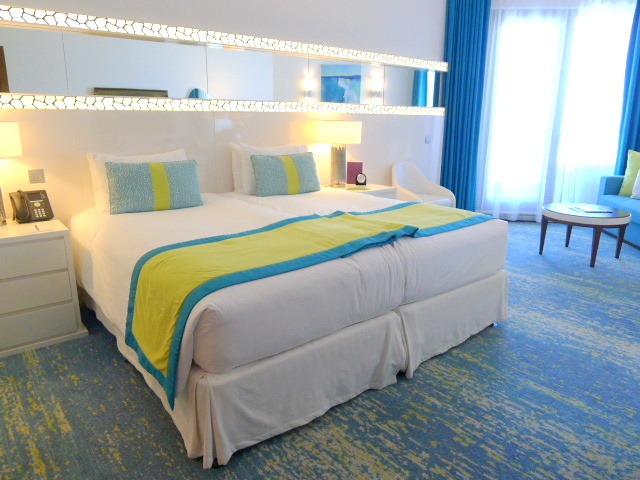 Given its location and its four star status, what I found most impressive about JA Ocean View Hotel was its price point which beats the price of most of the hotels in the area. JA Ocean View Hotel offers a range of his and hers, and couples spa treatments to re-energise and rejuvenate you during your visit to Dubai. The treatment rooms are comfortable and the treatments are well priced for Dubai. We tried a hot stone massage (60 minutes, AED380 – about £63 per person) where stones were heated and used on the body as part of the treatment. Known for muscle relaxation, relieving stress, releasing toxins, pain relief and improved blood circulation, the heat emanating from the stones felt wonderful and soothing. The treatment was fantastic, and I was well impressed with the professionalism of the therapists. Another nice touch was the bowl of floating flowers placed under the treatment bed so that when you laid face down, that was what you got to see rather than a bare floor. JA Ocean View Hotel is part of the JA Resorts & Hotel Group that also operates Bateaux Dubai, an air-conditioned luxury dinner cruise that sails along The Creek that runs through old Dubai. A four-course dinner on Bateaux Dubai including a welcoming drink is AED395 (about £67) and with unlimited house wines is AED495 (about £84). And if you book through the hotel, the price includes transfers to and from the boat. I must confess to feeling dubious about going on a dinner cruise. But TripAdvisor rates Bateaux Dubai as one of the top dining experiences in Dubai, and having now been it’s easy to see why. Bateaux Dubai is an air-conditioned state-of-the-art vessel that glides effortlessly through the water with an anti-reflective glass enclosure that allows diners to openly enjoy the views. 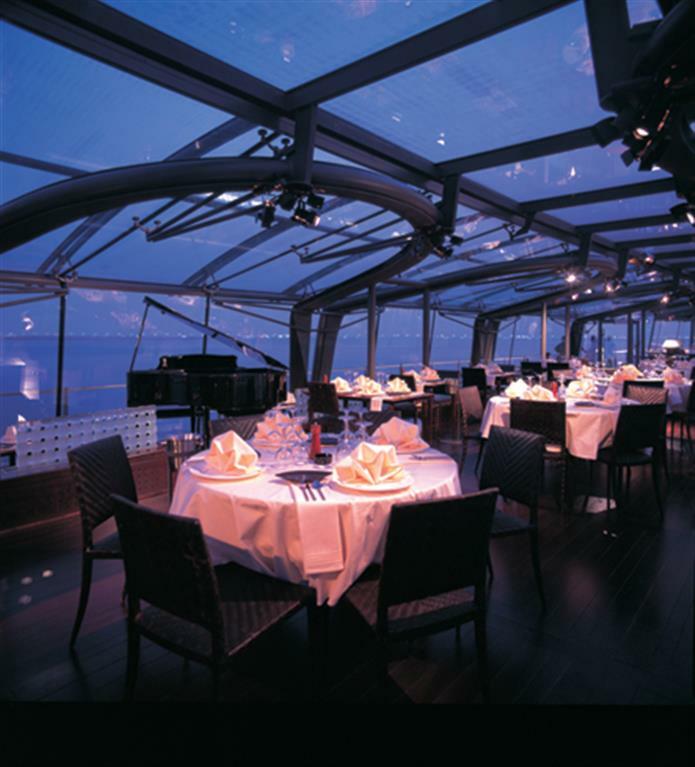 There is also an outer deck area, and the boat can accommodate up to 200 diners for a sit-down four-course fine-dining meal where impressively one can order starters, mains and desserts from a contemporary à la carte menu. The meal began with some yummy canapés followed by the first course of a creamy tomato and basil soup. It was delicious with a fabulously sweet flavour coming through from the tomatoes. The aroma from the basil rounded the soup off nicely. From the à la carte menu, a pan-seared scallop and prawn starter was tasty and well cooked. Accompaniments included a cauliflower purée that was wonderfully creamy, a flavoursome confit of tomatoes and a crunchy green apple and celeriac salad. There was also a superb squid ink parmesan tuille that was crispy and light with a great parmesan flavour. 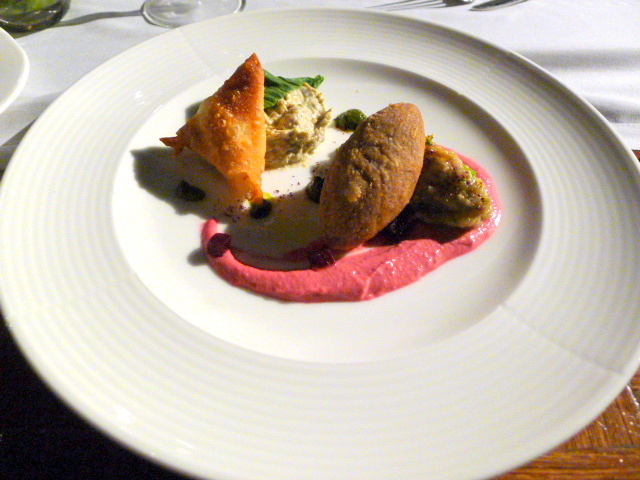 A contemporary Arabic mezze containing a selection of beetroot hommous, smoked aubergine baba ganoush, beef kibbeh, cheese sambousek and crispy Arabic bread were all nicely done. But the winning starter was a sesame crusted yellow fin tuna carpaccio and tuna tartare with harissa, salad of baby pear and wasabi mayonnaise. The tuna was resoundingly fresh and sweet, and the contrasting flavours from the harissa and wasabi gave this dish a kick. 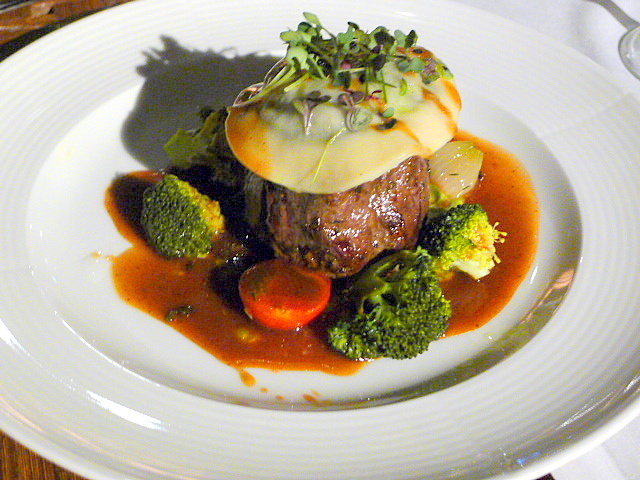 To the mains, and a generous piece of beef fillet, cooked medium rare, was delicious and rich with flavour. It came with a luscious thyme infused potato fondant, wild broccoli cooked such that they still held onto their bite and an excellent smoked rosemary jus. This was a great dish overall, but it was slightly let down by the goat’s cheese ravioli which was overcooked, leaving the pasta rather soggy. A second main of lamb loin with braised lamb shoulder was also generously sized. 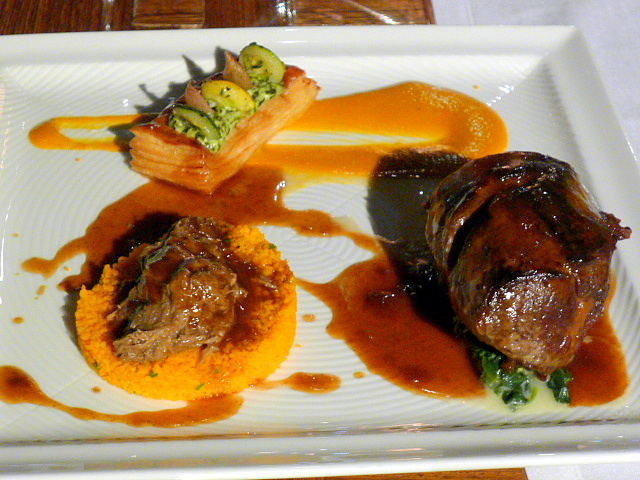 The lamb loin was very gamey in taste and the lamb shoulder was extremely tender with a good flavour. But unfortunately a roasted red pepper purée had a tinge of bitterness to it, and although the topping on a goat’s cheese and red onion tart was yummy, the puff pastry base could have been crispier. 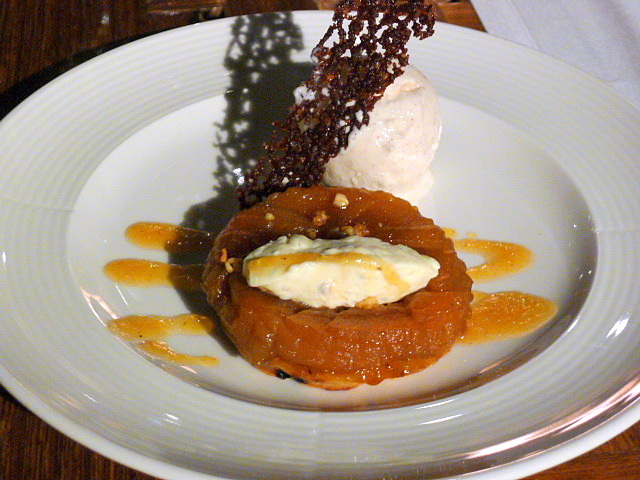 We adored the dessert of spiced pear tarte tatin topped with a dollop of creamy gorgonzola and toasted walnuts. The saltiness of the gorgonzola worked exquisitely with the sweet softness of the pears, and the walnuts gave the tarte a lovely crunchiness. The accompanying honey cinnamon ice cream and caramel sauce were also delicious. 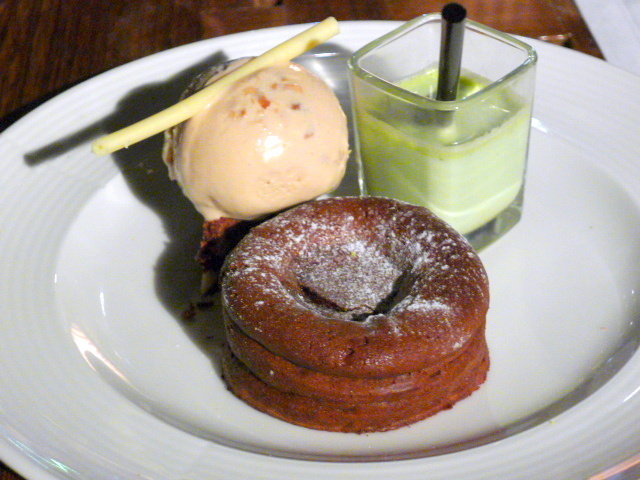 A double dark chocolate fondant was rather yummy and oozed with a wonderful rich chocolate centre. Paired with a fabulous peanut butter ice cream, a bitter chocolate brownie and a pistachio milkshake, there were perhaps a few too many elements in this dessert. A mango, coriander and chilli cheesecake was nicely creamy, but it wasn’t strong on the mango flavour and the biscuit base was a little soft. 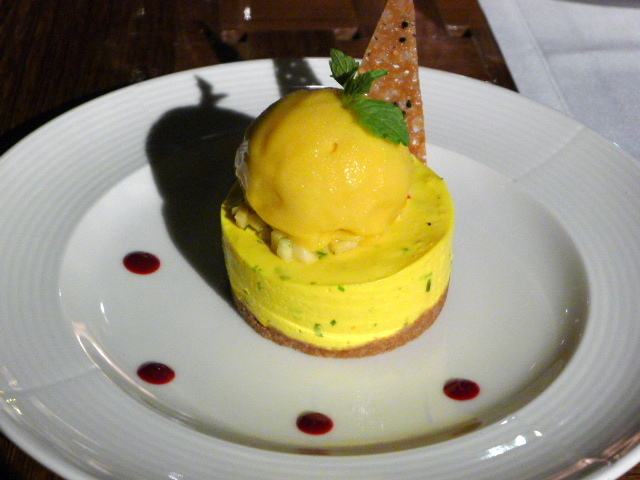 But the topping of mango sorbet was refreshing to round off an otherwise satisfying dessert. I adored Bateaux Dubai, and I was surprised at just how much I enjoyed it. The experience was effortless and surpassed all my expectations. The food was delicious, the portions generous, and everything came together like clockwork. Bateaux Dubai sailed for two and a half hours. 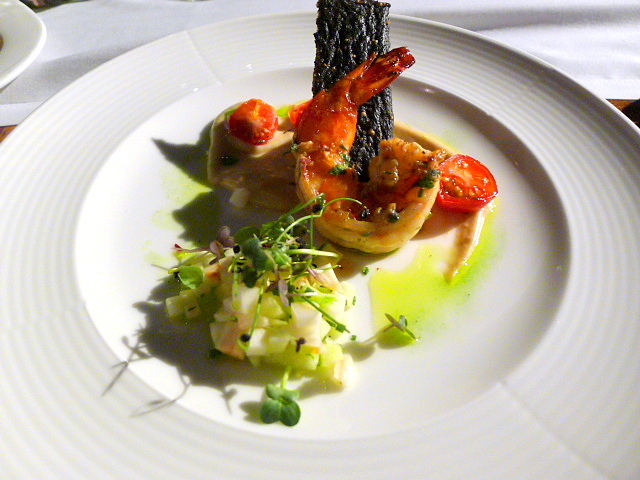 In that time four excellent courses were cooked to order and presented with seamless service. Given the minimal kitchen space, time constraints and the number of covers, Bateaux Dubai proved itself to be an incredibly efficient operation that was nothing short of impressive. The only thing I might consider changing would be the slightly cheesy elevator music. 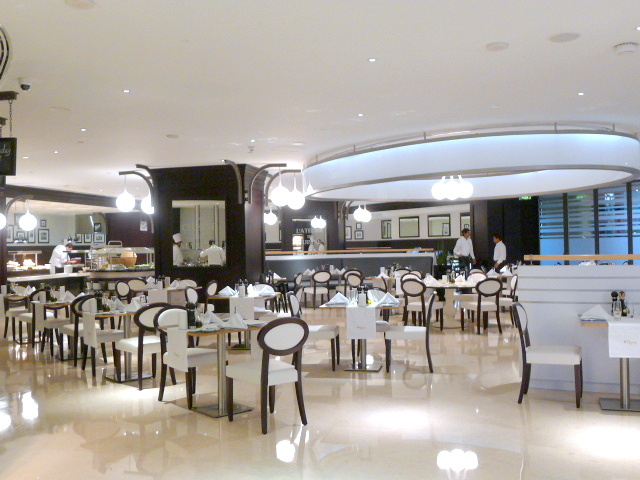 Four-course dinner including a welcoming drink is AED395 (about £67) and with unlimited house wines is AED495 (about £84). Includes tax and service.